Not long after our return from visiting the flower garden at Keukenhof, Holland, the boys and I were playing outdoors. 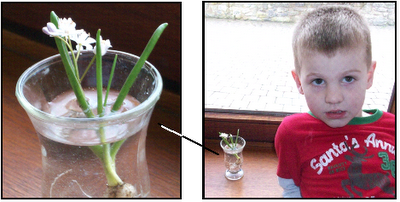 John found a small, white flower in some loose soil and pulled it up, roots and all. 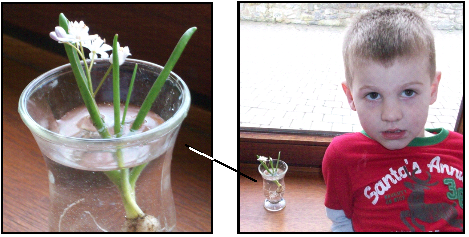 I suggested we put the flower in a glass of water, set it on a windowsill, and see what happens. John found the roots interesting and we talked about how the flower sends its roots in all directions to find water and other nutrients. 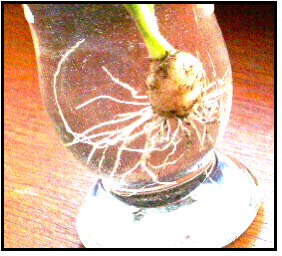 I said that since the roots were not damaged, the flower could live for several days in the glass of water. Here is a close-up of the flower’s roots. Several days passed. The flower even added new blossoms. John decided to return it to the ground so that it would live through the Spring and Summer. Our son and his family have since returned to the United States and a new Air Force assignment. I’m sure the little flower has survived and is adding its glory to the Belgium summer. Where’s the math and science in John’s flower experience? Besides the more complex botany and biology, there’s a simple and structurally important symmetrical form to be seen in leaves, stems, and roots. It’s a structure that helps a five-year connect what’s above the ground and what’s below the ground when they see a planted tree or flower. Trunk, limb, twig is a branching structure much studied by scientists and mathematicians. Branching is a highly efficient way to collect or distribute something. 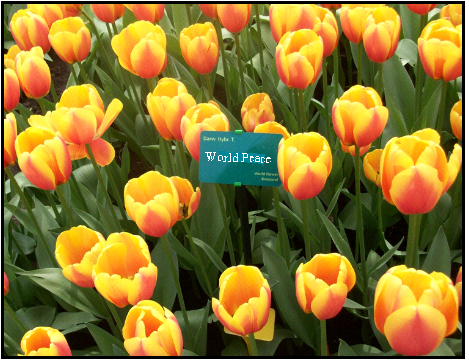 In a planted tree or flower, the top endpoints of the branching system are called leaves. Branching maximizes the number of leaves (nature’s solar panels) available for collecting the sunlight necessary for photosynthesis. The roots maximize the collection volume for finding water and subsurface nutrients. Branching is a highly efficient way to collect or distribute things like sunlight, corn flakes, and taxes. Not all branching systems are like the one shown above that has branches at both ends. Many branching systems are two-way systems. Corn flakes are made at a factory, shipped to a wholesaler, transshipped to a retailer, and purchased by a customer. Money flows in the opposite direction, from customer to corn flake maker. Branching is an important idea to teach our kids and grand kids and is one of those science and math ‘themes’ we can look for throughout all of nature. John will be starting Kindergarten soon. With the push to get kids reading and doing ‘math’ from day one in school, I wonder if the first school year wouldn’t be better spent teaching kids a reverence for living things.